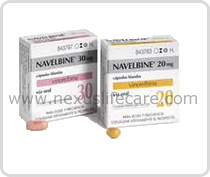 Uses:- Navelbine Capsules is used to treat various types of cancer. Navelbine Capsules is a chemotherapy drug that works by slowing or stopping cancer cell growth. Navelbine Capsules is available in the form of capsules and injection too. Side Effects:- Nausea, vomiting, fatigue, constipation, diarrhea, dizziness, muscle aches, joint pain, or irritation at the injection site may occur.